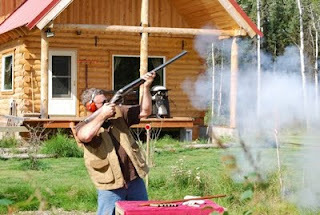 Shooting the 4-bore is not soon forgotten! The maximum load was: a full ounce of powder (440 grains), a 1743-grain bullet, for a muzzle velocity of 1492 fps! Above: full recoil just before stepping back a step to keep my balance. 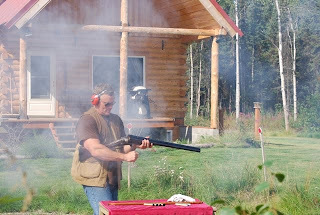 Below: the smoke is still in the air as I break the action.